NEW YORK – Look, up in the sky! It’s a bird! It’s a plane! It’s … #711? No, that’s not a typo. #711 was, believe it or not, a 1940s superhero. Imprisoned for an offense he didn’t commit, this crime fighter – part man, part number – would escape his confinement nightly to seek justice. Morris’ good-humored tone makes his well-researched volume a delight. And, though it includes some mild scenes of combat, there’s no other content of concern to parents. Even so, Morris’ sharp, insightful narrative often deals with concepts that would likely confuse children. Who knew, for example, that Marvel Comics pioneer Steve Ditko was interested in philosopher and novelist Ayn Rand’s political ideas? 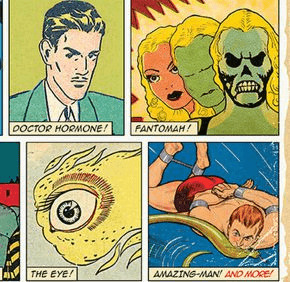 “Regrettable Superheroes” is divided into sections covering the golden, silver and modern ages of comics. As Morris reveals, it wasn’t only hacks who thought up the lame also-rans he resurrects. Some were spawned by the genre’s royalty, including Jerry Siegel, Joe Simon, Jack Kirby, Roy Thomas, Ditko and C.C. Beck. The book is particularly refreshing for those who might have grown weary of “serious” and “adult” treatments of superheroes. These goofy, short-lived misfires provide the smiles that have been missing in our own time amid the dark adventures of the problem-ridden men – and women – wearing tights. He failed to last the duration. Clearly, not even comics-crazed Hollywood would touch any of these guys. Never fear, however: Like Lady Satan, Damien Hellstrom – Son of Satan’s alter ego – employed a diabolical name while, in reality, fighting against evil. The book contains stylized images of violence. The Catholic News Service classification is A-II – adults and adolescents. Not otherwise rated.